The Coastal Messenger will be away from home port on missionary voyages from January 28 to December 05 except for annual maintenance between February 20 to April 08. See the 2019 Vessel Schedule. The mission vessel Coastal Messenger is a fully original design by Roy Getman, Coastal Missions Society. Design standards are equivalent to the American Bureau of Shipping. Design checks and stability and hydrostatic studies were conducted by Robert B. Harris, Naval Architect, Vancouver. Coastal Missions workers and persons hired or contracted under supervision by Coastal Missions built the vessel without certification. Hull fabrication took place at Jenkins Marine, Victoria, BC. Joshua Enterprise in Calgary, Alberta built the pilothouse. Other fabrications and constructions were done at the Coastal Missions shop in Chemainus. The final assembly took place in Victoria. The completed ship launched at Esquimalt Department of National Defense facilities September 10, 1998. She was commissioned into missionary service April 3, 1999. If you are interested in the whole story, enjoy reading the 1994-1998 Vessel Construction. 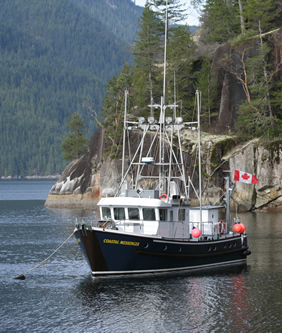 The Coastal Messenger operates under the Constitution of the Coastal Missions Society, a Limited Corporate Society in British Columbia, and a charity in Canada and the United States since 1980. Vessel activities are fully charitable and non-commercial - she is not leased, hired, or chartered for passengers or freight. The Coastal Messenger is crewed by missionaries in scheduled Christian outreach ministry. Site updated Nov 25, 2018.